Having worked with Cheltenham Festivals on the annual Literature Festival for the last five years, Production AV were looking forward to being back for a sixth year providing the video solution to all the venues at the festival. 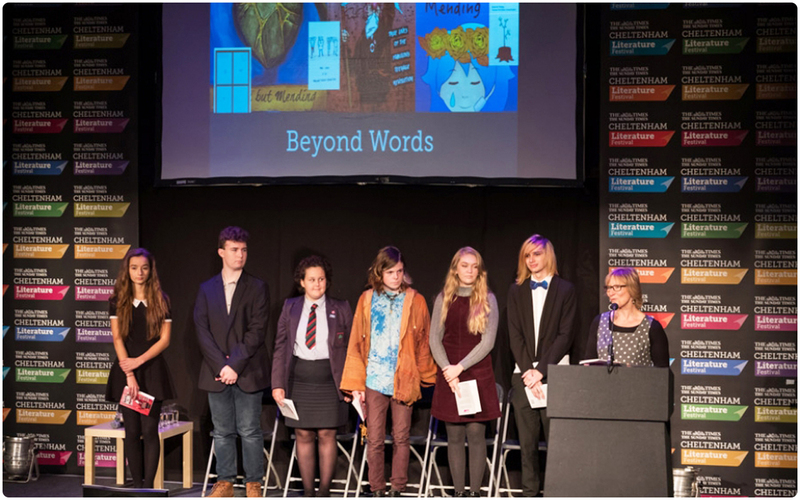 From the 7th – 16th of October, Cheltenham Literature Festival promised to continue delivering an inspiring mix of debate and discussion by welcoming over 600 of the world’s greatest writers, poets, politicians, thinkers and stars to Cheltenham. In Forum, the main venue of the festival, Production AV provided a full video solution using a our Barco S3-4K Screen Management System coupled with its Barco EC-50 Controller which enabled us to manage numerous signals and outputting them to our Christie LHD700 Full HD Projector via a fibre system. Situated in front of house, three Sony PMW-EX3 HD Video Cameras provided numerous angles for the technical director to select during each event and one camera operator worked back stage controlling the two close up cameras using a pan tilt remote head system which enabled less intrusive production and greater communication between the technical team. 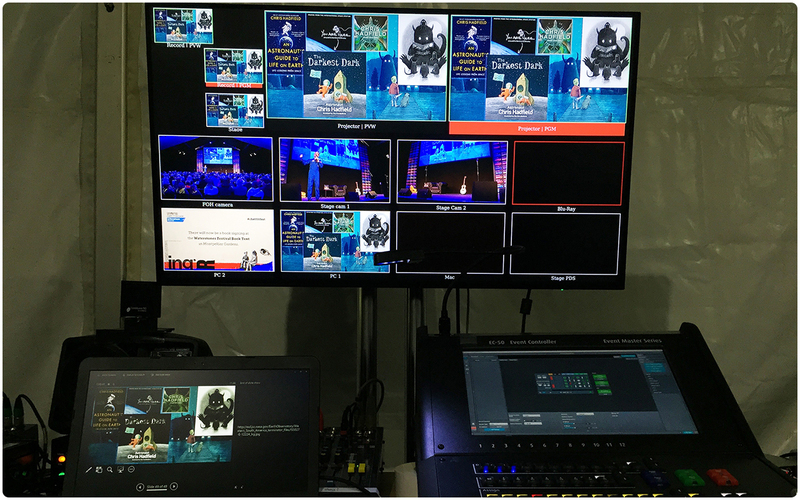 The Barco S3-4K, also accommodated two laptops and was able to seamlessly switch between keynote and powerpoint presentations as well as raising the production quality by providing PIP’s of the camera feed when desired over presentations. The last output required from the Barco S3 was to the LG BD370 Blu-ray Player that recorded certain events for later use. Also provided for the guests was the Interspace MasterCue V6 Cueing System and comfort monitors leaving guests with the peace of mind that they can easily manage their presentation. In The Pillar Rooms, the venue was more intimate and required a smaller technical setup. The main operating hardware was a Barco PDS-901 3G 9 in 1 Out Seamless Switcher that took feeds from two ASUS X555LA 15 Inch Laptops and outputted to an in-house projector as well as another LG BD370 Blu-ray Player for recording purposes. Comfort monitors and another MasterCue System was also set up in this venue to improve the presenting experience. Working with Adrian Hensley and the team at Cheltenham Festivals is always a pleasure and getting to play our part in providing this yearly gathering of people with fantastic intellect as well as fascinating stories is always near the top of yearly event experiences! We would like to thank Adrian and the team for continuing this relationship between our companies into it’s sixth year and we hope it continues as it is such a rewarding and enjoyable event to be apart of each year. 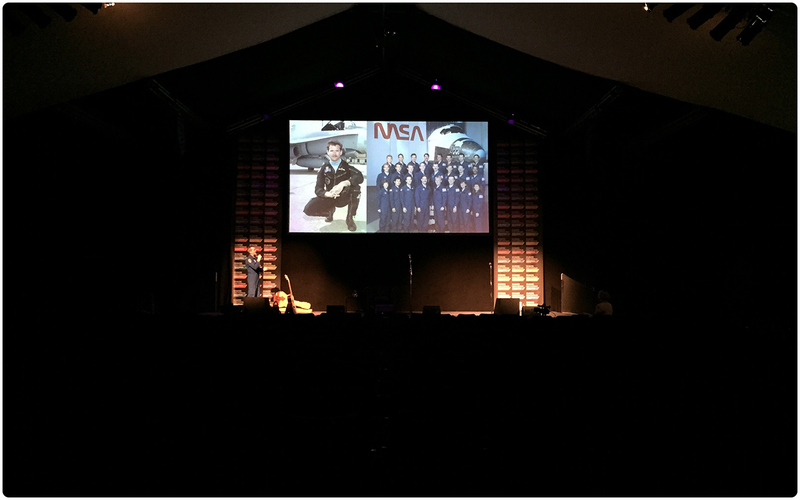 Production AV were appreciative to be welcomed back to the Science Festival for the fourth year running to supply an immersive, audiovisual solution for the event space named Space World. Being asked to provide a complete solution, from collecting and editing content to programming the show, was a challenging yet enjoyable experience and we are proud to be involved in the education of the next generation in the topic of space travel. 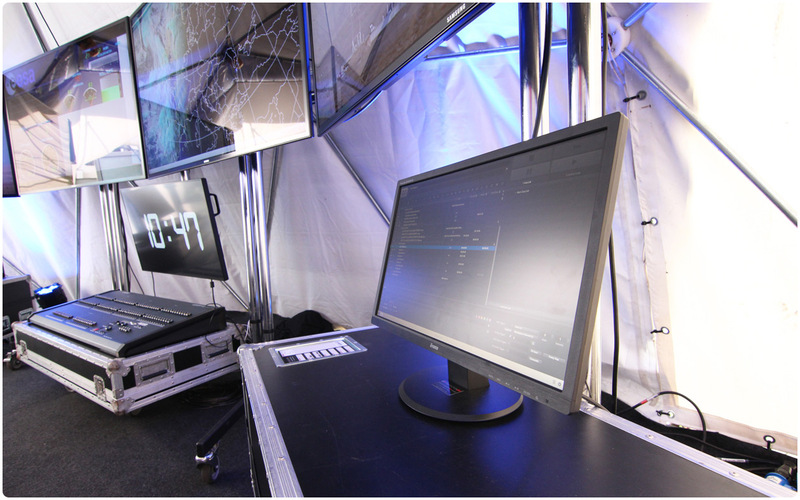 Using four Samsung ME65B 65″ LED Flat Panels as the centre piece for the mission control experience, Production AV were instructed to find realistic and suitable content to put into a 10 minute video sequence that would show a rocket preparing for launch as well as taking off. To greater enhance the experience, QLab was used to program lighting and smoke effects at numerous points throughout the video sequence as well as syncing the timing screen to match the rockets take off. Once this was set up, control could be handed over to the mission control presenters who only needed to click the play button and the entire sequence would run unaided. 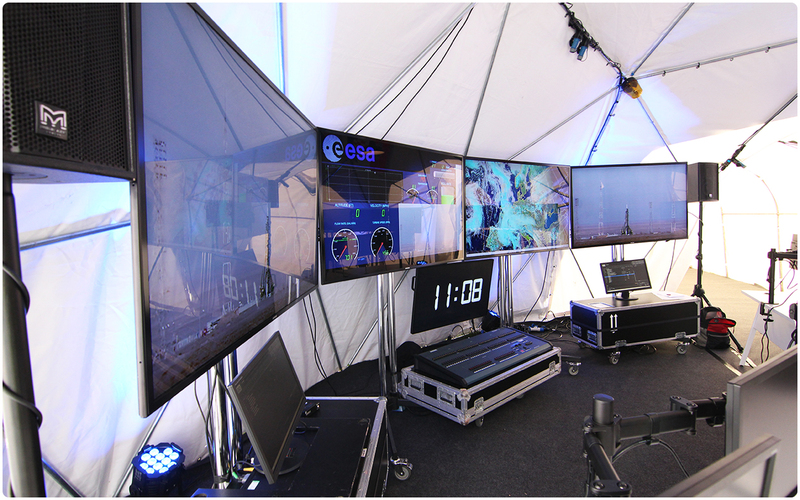 Numerous other screens such at 50″ and 42″ plasmas were also installed around the venue and a Christie LHD700 Projector was positioned in the space dome tent as used along with other AV equipment to communicate with Tim Peake on his last ever interview on the ISS before he returned to earth. A massive thank you from Production AV to Adrian Hensley and the whole of Cheltenham Festivals for having us provide such a unique and creative solution. Below is a short clip from Tim Peake’s direct interview with the Science Festival. Tim Peake doing a direct QnA with Cheltenham Science Festival in his last ever interview before he returns back to earth from the ISS. #timpeake #astronaut ???? 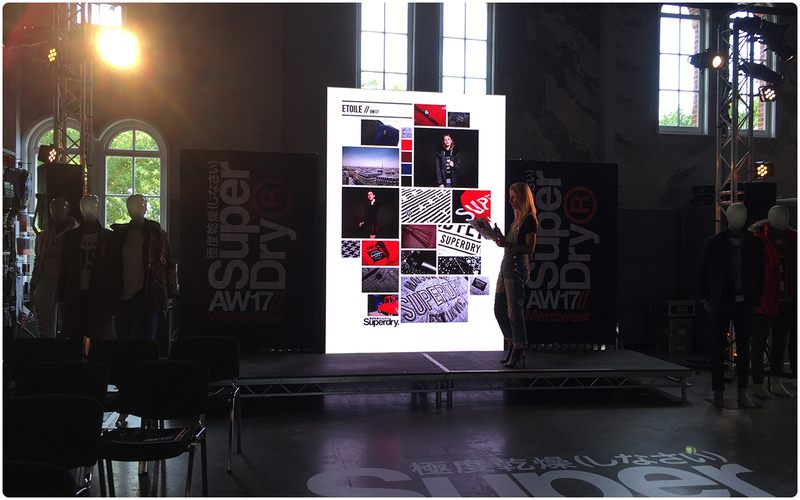 Production AV had the pleasure of working for our long term client Tarren Production Ltd on several parts on the Autumn/Winter 2016 launch held by Superdry in Cheltenham in early January 2016. SuperGroup used a disused warehouse near their HQ in Cheltenham, which was used for a catwalk show and after show party, as well as running a series of presentations in their new staff canteen adjacent to the new site. In the Cafe space, Tarren Production contracted Production AV to supply a simple but complete production package of sound lighting, video and staging. Utilising d&B Audio Q7 and QSUB speakers, D12 amplifiers and Allen and Heath QU32 mixing desk to provide a full range sound system for the spoken word and presentations, video was taken based around a 12,000 Lumen projector and 16’x9′ screen for the brightly lit space, with a Barco PDS901 switcher for allowing a clean fade between laptops and video playback handled by PlayBackPro+ running on Apple Mac Mini computers. 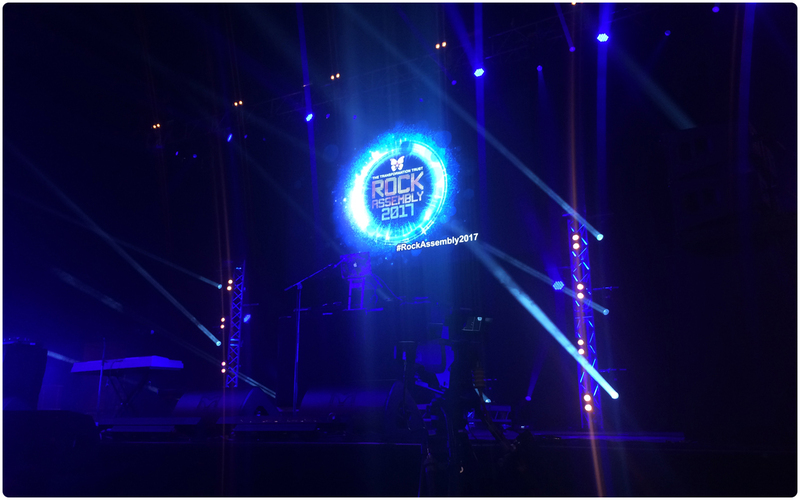 Simple lighting highlighted the presenters on the 3m x 2m stage that was set up in the venue. Olie Goulding was onsite to oversee the running of the event and ensure that the presenters could focus on their presentations. Over in the launch area, Production AV provided several small but key bits of infrastructure. For the catwalk, a pair of Sony PMW-EX3 cameras were rigged in fixed positions, then fed their Full HD signals back to 3 pairs of Panasonic flatscreen displays positioned to allow the show caller and dressing teams to clearly monitor the action on the catwalk, and ensure they timed the model entrances correctly. Whilst not an overly glamorous part of the show, quality of the image and reliability were critical to ensure models were able to time the show correctly. 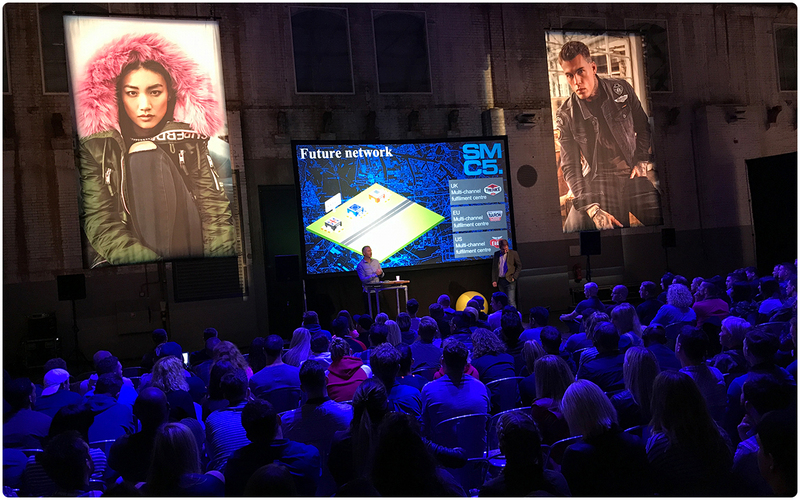 In a temporary structure located beside the catwalk space, members of the Superdry team briefed different groups on the new Sports and Snow product lines. 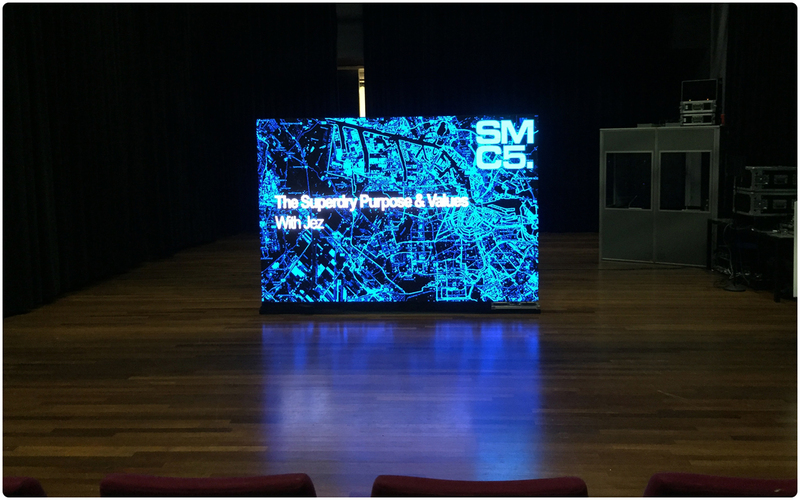 Within this space Production AV provided a large 65″ Samsung LCD flatscreen display to enable the presentation to be seen clearly by the delegates. Another small d&b sound system with a wireless microphone allowed the presenter to be heard over the background noise of the busy site. Our thanks go to Tarren Production Ltd for asking us work for them on this event. With just 6 months to go until Brazil, the UK Media Launch of the new Nike Brazil Shirt couldn’t have been more important. The event was a slick multi reveal exhibition, designed & managed by Ear to the Ground; Production AV provided a full HD projection system and video playback solution. It was an intimate launch for selected Media and young aspiring footballers held in the London Film Museum, Covent Garden. Nike Creative Director of Football, Martin Lotti and Brazil footballer, David Luiz, gave their views on the design process and insight into the innovative new kit. Using our Barco PDS 901 switcher and Christie Digital LHD 700 projectors, the event also showcased an interesting history of the journey of the humble football shirt, to its present day form. The Autumn launch of the long awaited Nike Hypervenom football boot, managed by Ear to the Ground, was a very special event. 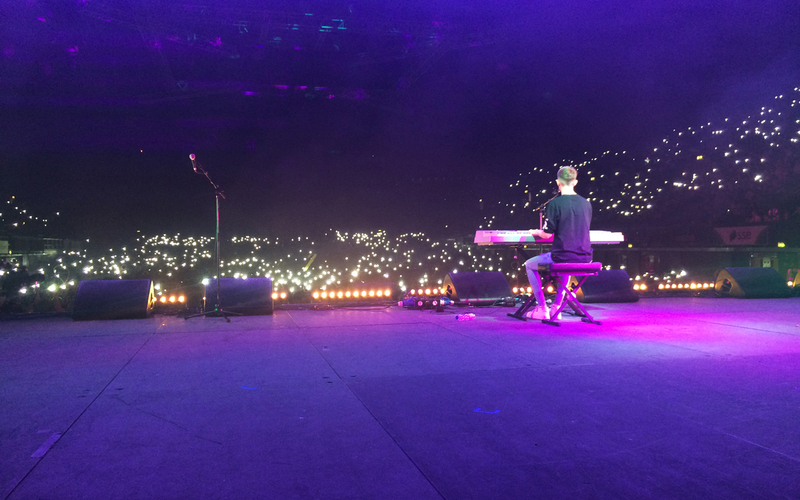 The location, a derelict Welsh Chapel in central London, provided a unique gritty backdrop which was taken over and transformed into a football amphitheatre. A custom football cage was built in the main space and the venue was transformed through the creation of an immersive journey for guests. The launch staged a 2 aside knockout tournament, and involved putting 200 young footballers up against each other under the watchful eye of Premier League players Danny Welbeck, Daniel Sturridge & Christian Benteke. 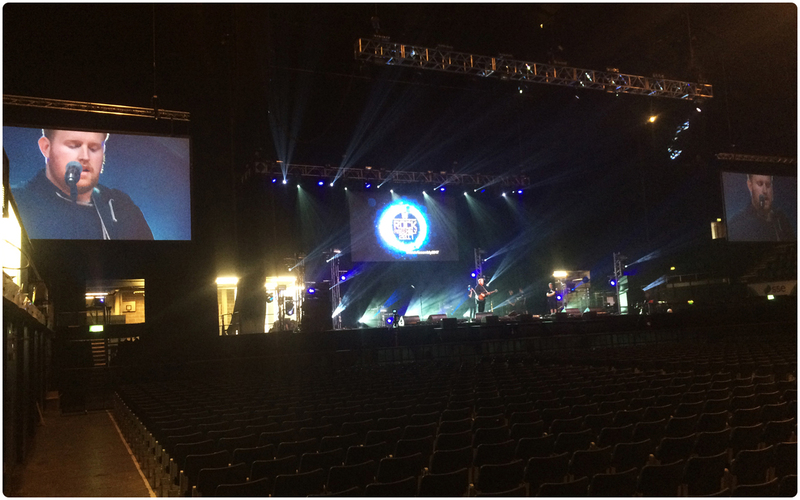 Using Christie Digital LHD700 projectors, Production AV projected the all important scoreboard onto the venue wall, as well as supplying large screen flat panel displays throughout the building. On the lower floor there was a NIKEiD exhibition area which employed our Christie projectors to project specific Nike videos and images. After the tournament, Headliner, Giggs, the London based rapper, ensured the Hypervenom atmosphere continued. Taxan U5-732 3500 Lumen DLP projector.